1. Bins are not to be filled above the rim – nothing is to protrude above the rim at all. If bin is overfilled we retain the right to remove items as necessary in order to make it legal to transport. These items will be placed next to or near the bin. If this is not possible to do for whatever reason, we may tip the contents of the bin back onto your property without a refund of any kind. In such case we are not liable for any damage incurred to your property / vehicles. 2. If any particular skip bin has a weight limit and the contents loaded into the bin exceed that weight limit, the customer will be charged the lesser of either excess weight or an upgrade to the appropriate waste type. If payment for the bin was made via credit card/debit card, the card will be charged automatically for any extra amounts. 3. All unsuccessful attempts at either delivery or collection of a bin where the reason the attempt was unsuccessful is outside the control of Matt’s Skip Bins will incur a fee of a minimum of $150 per delivery or collection attempt. 4. If you order a merchant chargeback for any payments made to Matt’s Skip Bins the waste will be returned to your property at a later date. 5. Please ensure there is a clear path to the drop off or pick up point of the skip bin on the arranged day we are due at your property. Please note that the truck has to reverse into the same position to collect the bin as when it was delivered. In ANY circumstance regarding delivery or collection of a skip bin, Matt’s Skip Bins accepts no responsibility for damage to your property including but not limited to grass, driveway, gardens, trees, carports etc. The driver will place the bin in the safest position upon delivery. If you require the bin to be placed in a different position you take on the risk and associated damage costs if applicable for any damage incurred to yours or council property as a result. Please keep in mind the trucks can get bogged very easily on wet grass (even weeks after it has rained) and you risk damage to your property and / or nature strips upon collection of bin if it has rained between delivery and collection of your bin including ruts/tyre tracks/holes in your grass etc. 7. When an attempt is made to collect the bin and the customer requests Matt’s Skip Bins to come back another time/date then a minimum call out fee of $150.00 will be charged. 8. If at any time after a bin has been delivered to the customer’s property and the customer decides they want a different sized bin, a minimum fee of $150.00 in addition to the size upgrade cost will be charged to uplift the original bin and replace it with the new bin. 9. ALL extra/excess/futile/demurrage etc fees that are charged to your credit/debit card are done so without verbal contact. Receipt will be emailed/mailed after any charge is made. 10. Once the skip bin has been delivered it may not be moved for any reason. If the skip bin is moved there may be a need to drag it back into the original position in order for the driver to pick it up. In such case, we accept no liability for damage caused to your property / vehicles etc. If it is moved into a position that causes damage to our truck whilst trying to collect it, you will be liable for the damage. If our truck gets bogged due to the bin being moved or for any other reason that is out of our control, you will be liable for heavy vehicle recovery costs. 11. Whilst the skip bin is in your care, you assume all responsibility for it. If the bin is damaged, you will be held liable for repair costs. 12. A council permit may be required to place the skip bin on any council land, including nature strips and the road. Please contact your local council to check the requirements if you require the skip bin to be placed on any council land. The customer assumes all responsibility for any fines incurred if no permit has been acquired when needed. A minimum of $150 call out fee is payable if we arrive for delivery, you request the bin to be placed on council land and then reject delivery when we refuse to place the bin on council land without a permit. 13. We reserve the right to list any default payments with relevant credit reference agencies which will affect your official credit rating. 14. By ordering and / or accepting the skip bin, you agree to these terms and conditions. If you have questions or concerns regarding this statement, you should first contact Matt’s Skip Bins on 02 4708 2927. 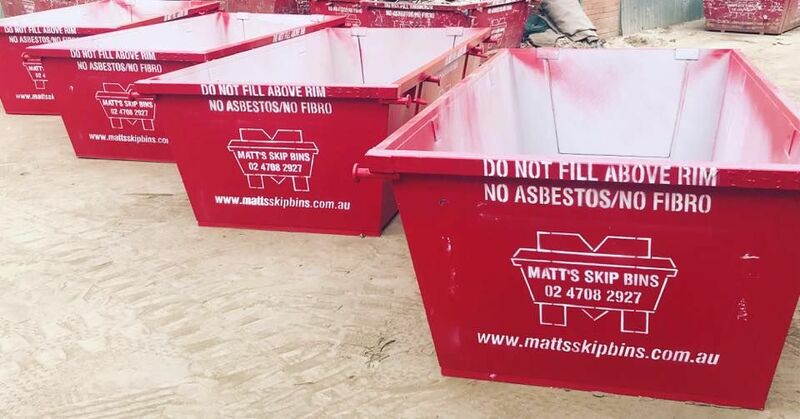 In order to use the Matt’s Skip Bins website, we may require information from you in order to provide the best service possible. Any information collected by Matt’s Skip Bins is collected via correspondence from you or your company. This may be via the telephone, Email, mail, fax or directly through our website. Any details collected from Matt’s Skip Bins’ customers is required in order to provide you with our products and/or services, and a high level of customer service. The security of your personal information is important to us. When you enter sensitive information (such as credit card numbers) on our website, we encrypt that information using secure socket layer technology (SSL). When Credit Card details are collected, we simply pass them on in order to be processed as required. We never permanently store complete Credit Card details online. Matt’s Skip Bins uses personally identifiable information for essential ommunications, such as Emails, accounts information, and critical service details. We may also use this information for other purposes, including some promotional Emails. If at any time a customer wishes not to receive such correspondence, they can request to be removed from any mailing lists by emailing us at [email protected] . Matt’s Skip Bins may at its discretion use other third parties to provide essential services on our site or for our business processes. We may share your details as necessary for the third party to provide that service. Matt’s Skip Bins does not share any information with third parties for any unknown or unrelated uses. Links on the Matt’s Skip Bins site to external entities are not covered within this policy. The terms and conditions set out in this privacy statement only cover the domain name of www.mattsskipbins.com.au . Matt’s Skip Bins uses the eWAY Payment Gateway for its online credit card transactions. eWAY processes online credit card transactions for thousands of Australian merchants, providing a safe and secure means of collecting payments via the Internet. All online credit card transactions performed on this site using the eWAY gateway are secured payments. – Your complete credit card number cannot be viewed by Matt’s Skip Bins or any outside party. – eWAY at no time touches your funds; all monies are directly transferred from your credit card to the merchant account held by Matt’s Skip Bins. After ordering online, you will receive an email confirmation from eWAY containing your order details (if you have provided your email address). We will normally confirm receipt of your order within a few minutes of ordering. We will attempt to deliver your skip bin on the requested delivery date; however if goods are unavailable delivery will take a little longer. If you wish to query a delivery please contact us at www.mattsskipbins.com.au . All cancellations will incur a 10% cancellation fee if notice is given at least by the day BEFORE delivery (7AM – 5PM). If you would like to cancel your order after 5PM the working day before, on the day of, upon or after delivery you will incur a $150.00 fee. If you change your mind in regard to the size of the bin required once the bin is already loaded onto the truck or once it arrives at your property, you will incur a $150.00 fee for us to make a second delivery to your property with the different bin. If you are not finished with the bin when we arrive to collect it on the specified day, you will incur a $150.00 call out fee if you did not call us to ask for an extension (and the extension was approved).